Run is the game that everyone should be (but for some reason aren't) talking about! Nicklas made the original version in GameMaker and has two demos: one for iOS, which you can't play or anything. The other one was made using Scirra's Construct, and is playable right here on the website. The game is inspired by Euskefeurat's song Bonden och björn: It's about a farmer who gets attacked by a bear, starts wrestling with it, lifts it up and carries it all the way home and (spoiler alert!) beats it to death with an axe. 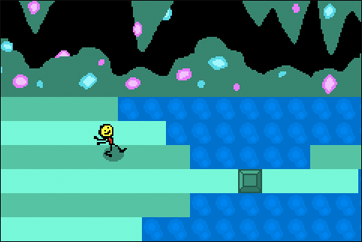 The gameplay is really simple; you run from left to right, trying your best to avoid the obstacles you encounter along the way either by jumping over them or by smashing through them. The fast pace and tricky level design make for a pretty challenging (and a little bit addictive) game.